The Elder Scrolls Online version of Tamriel is stuffed to the slaughterfish gills with Other People, and so help Zenimax you’re going to interact with them. Update 3 is packed full with the very best in social lubricants that aren’t alcohol: custom guild ranks, colourful clothes and matching bibs. Add a splash of colour to your armour with the new dye system. 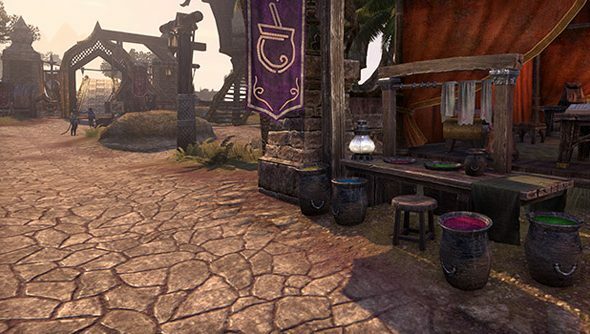 Dyes aren’t bought from merchants or crushed out of plants, but earned by completing achievements – the sort of level of abstraction that can become a bit irksome in MMOs. But dyes are tied to achievements you’ve already finished will be automatically unlocked – so log in today and you’ll likely have plenty of shades to play with at the nearest, er, dye station. What’s more, you can now fly the colours of your guild. Guild leaders can assemble their own tabard designs from a range of tattoo-like icons, which should help keep friends visible in the fray. With any luck, the same guilds will develop their own unique personalities and perks through new custom ranks and members-only shops. On a weekly basis, guilds will be able to bid on a store location to make their shop available to the public – and reap the rewards in gold. Elsewhere, as always, there are bug fixes. Check the full patch notes for those. Other People are the one thing The Elder Scrolls Online has over Skyrim. Is that why you play it?